Sunpak Thyristor Auto 311 Electronic Flash Unit. Condition is Used. Shipped with USPS First Class Package. I would use flash triggers to fire this flash. It appears to be clean and workable. 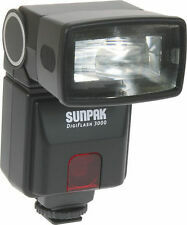 Sunpak DigiFlash 3000 Electronic Flash Unit (for Nikon i-TTL). With afour-position, 90-degree bounce head, harsh shadows can be virtually eliminated while subjects are illuminated with a bright, pleasing light. 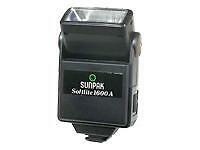 Sunpak Auto 611 Thyristor Flash w/Bracket and Trigger. Condition is Used. Shipped with USPS Priority Mail. The flashes are working fine and I have no further need to use either. Used Canon 580exII and sunpak grip. flash does test fire. 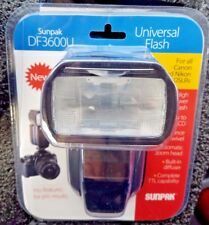 the sunpak grip does hold the flash. Sunpak GX8R Universal Macro Ringlight Flash Kit. Ex. The unit is tested and working as it should. This design makes the actual flash part much lighter in weight so there’s no. The unit is in used condition showing normal signs of wear. We WILL NOT claim your item is a gift. 5 out of 5 stars - Sunpak GX8R Universal Macro Ringlight Flash Kit. Ex. 1 product rating1 product ratings - Sunpak GX8R Universal Macro Ringlight Flash Kit. Ex. Listing as used as-is. Powers up and fires. Very Good condition, see images. Multi-Dedicated for 35mm SLR's with TTL capabilities. Bounce and zoom. Great small flash. Good used condition, uses (4)AA batteries. Does not come with any other accessories. One (1) Nikon electronic flash unit as pictured and described. We all rally together under the battle call, "Hey! That's not junk!". Bringing about that shift. Drop us a line and we will assist if we can. All have been tested and work as expected. All show signs of wear from normal use, may have sticker residue or scratches in plastic. BATTERY HOLDER NOT INCLUDED. Because of the unknown age of these flash units, they are all being sold AS IS. Sunpak DF3000C Shoe Mount Flash for Canon. Condition is Used. Shipped with USPS First Class Package. Sunpak "Auto 411" Flash Unit,Thyristor. Multi Position Flash Head For Bounce Flash Use. It is compact enough to easily fit into your jacket pocket. Instant correction keys allow for easy and fast correction to settings. Power Settings from 1/1 to 1/32. Guide Number: 66' at ISO 100 and 35mm. This flash was most recently used by a professional photographer. It is not necessary to request an invoice, but you certainly may if you like. Complete with (6) AA batteries, PC coil cord, CA-1AF Canon EOS Module and instructions. Sorry, no bracket. It is fully functional and is in 100% spoltess condition. Looks unused. We'll make you happy if at all possible. Tested and all in good working order. Batteries not included. See photos for condition. 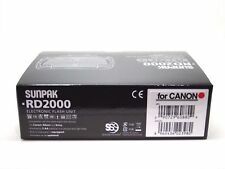 Sunpak PF20XD Digital Slave Flash - Factory Sealed. It is compact enough to easily fit into your jacket pocket. Sunpak PF20XD Specs Slave Timing Modes Instant Sync. Zoom Head None. Flash Duration 1/2000 to 1/30000 sec. SUNPAK Pro System 622 SUPER FLASH Works Great! Up for sale is a SUNPAK Pro System 622 SUPER, Handle Mount FLASH! Once one of the most powerful hand held flashes on the market. This one has been tested and Works Great! 4.5 out of 5 stars - SUNPAK Pro System 622 SUPER FLASH Works Great! 21 product ratings21 product ratings - SUNPAK Pro System 622 SUPER FLASH Works Great! The unit is new in the original box. Model: ZH-1. In good condition, with original box and paperwork. FLASH WORKS GREAT AND HAS BATTERY HOLDER AND WILL NEED 4 AA BATTERIES. For reduced glare or for softening highlights, just install the included diffuser. To produce more naturalistic skin tones, use the supplied 4300K color-correction filter. Full Nikon TTL flash dedication. Five position bounce head. Autofocus assist light. 6 Exposure compensation settings. Future ready upgradable firmware. SUNPAK 622 FLASH (X2). YES, YOU GET 2 622 FLASHES. FLASH (X2) IS IN GOOD USED WORKING CONDITION. TO DO THE POSED PHOTOS WITH BACKGROUND AT THE RECEPTION. HOLDER GOES ON THE BOTTOM OF FLASH HANDLE TO SECURE THE BATTERY; WE REMOVED IT BECAUSE WHEN USED ON LIGHT STAND THEY GOT ON THE WAY. I have not tested this item but it was well taken care of and is expected to work. MORRIS Underwater Flash. Can be used as a standard flash, not necessarily underwater. For the flash enthusiast. Tested, works fine. FULLY CHECKED OUT AND CLEAN. One (1) flash unit as pictured and described. We all rally together under the battle call, "Hey! That's not junk!". Bringing about that shift. Drop us a line and we will assist if we can. not included . This item is a Sunpak Auto 522 Thyristor flash with the Sunpak attachable bracket mount and Quantum Turbo battery in excellent condition. Everything works properly, including the Quantum Turbo battery, which has been recelled recently. Up for sale is a used Sunpak Auto DX 8R Electronic Lens Mount Macro Flash Ring With NE-2D Interface Module. Includes rings for mounting to filter rings size 49mm 55mm and 58mm. You are invited to buy a used Sunpak MZ440AF shoe mount flash for Nikon. Here is an opportunity to buy a GREAT item at the right price! Type Shoe Mount. Be sure to add us to yourfavorites list !